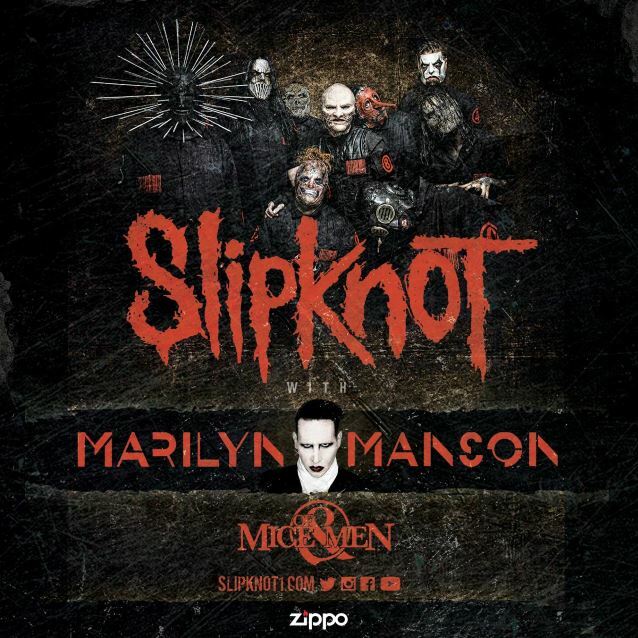 SLIPKNOT has announced full details of its massive summer headline tour with MARILYN MANSON and OF MICE & MEN. The North American trek will see the Grammy Award-winning group bringing their explosive live show across North America, kicking off June 9 at Salt Lake City, Utah’s USANA Amphitheatre. SLIPKNOT fan club ticket presales will begin March 1 at 12:00 p.m. local time, followed by Citibank presales on March 2, local Live Nation and radio presales on March 3 and general onsale March 4 at 10:00 a.m. local time. SLIPKNOT has selected “Goodbye” as the latest single from its most recent album, “.5: The Gray Chapter”. SLIPKNOT was nominated in both “Best Rock Album” (“.5: The Gray Chapter”) and “Best Metal Performance” (“Custer”) categories at the 58th annual Grammy Awards, which was held on February 15 at Staples Center in Los Angeles. “.5: The Gray Chapter” sold 132,000 copies in the U.S. in its first week of release to land at No. 1 on The Billboard 200 chart. “.5: The Gray Chapter” was released in October 2014 following a six-year hiatus during which founding SLIPKNOT bassist Paul Gray died and original drummer Joey Jordison was dismissed. MARILYN MANSON‘s latest album, “The Pale Emperor”, was released in January 2015 via the singer’s own label — Hell, etc. — in a joint venture with Cooking Vinyl and Loma Vista Recordings. Manson collaborated on the new album, his first in over two years, with noted film composer/producer Tyler Bates (“Guardians Of The Galaxy”, “300”, “The Watchmen”). 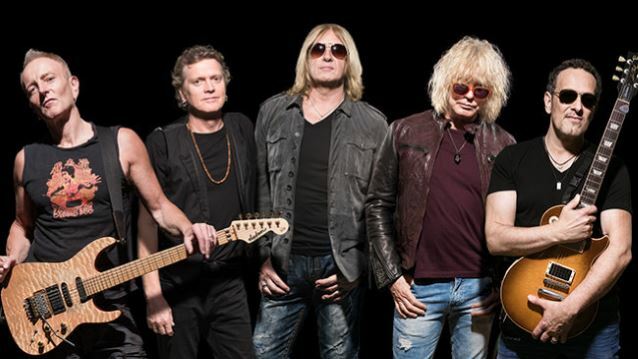 DEF LEPPARD will return to the road this summer for an extensive tour across North America due to overwhelming demand. The Live Nation-promoted outing will storm through 55 cities across all parts of the U.S. and Canada. It is set to kick off on May 1 in Orlando, Florida and wrap on October 10 in Cedar Rapids, Iowa. 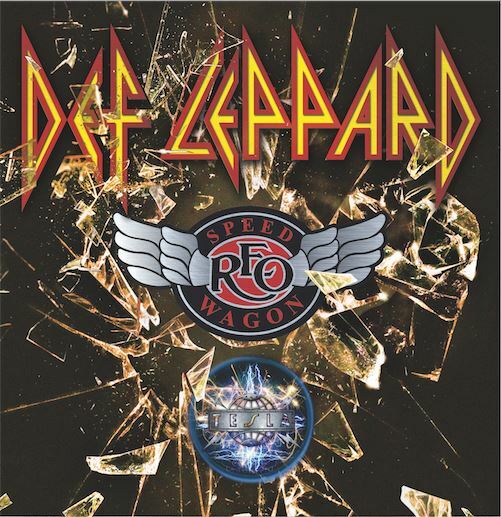 Joining DEF LEPPARD on their mighty summer outing are REO SPEEDWAGON and TESLA. Tickets will go on sale starting on March 4 at LiveNation.com. DEF LEPPARD recently rescheduled several postponed tour dates with STYX and TESLA because Elliott was suffering from vocal issues. DEF LEPPARD‘s latest, self-titled album entered The Billboard 200 chart at position No. 10 with first-week sales of just over 30,000 units — nearly all from pure album sales. The album is the band’s first studio effort since “Songs From the Sparkle Lounge” in 2008. Round Hill Music has entered into a co-publishing agreement with THE WINERY DOGS for their latest album, “Hot Streak”, the supercharged follow-up to the self-titled rabidly rocking 2013 debut of the three-piece musical dynamo. THE WINERY DOGS is the power trio featuring drummer Mike Portnoy (DREAM THEATER, AVENGED SEVENFOLD, ADRENALINE MOB), legendary bassist Billy Sheehan (MR. BIG, TALAS, DAVID LEE ROTH) and guitarist/vocalist Richie Kotzen (MR. BIG, POISON). “Hot Streak” debuted at No. 30 on The Billboard 200 chart, having shifted 13,000 equivalent album units in the week ending October 8, 2015. The CD was released in North America on Loud & Proud Records via RED (a division of Sony Music Entertainment) and in the rest of the world via earMUSIC. “Hot Streak” shows the powerfully pedigreed trio’s initial burst of collective chemistry was no accident, from the strum and headbang of “Captain Love” to the propulsive uplifting vibe of “The Bridge” to the introspective acoustic harmonic convergence of “Fire”. 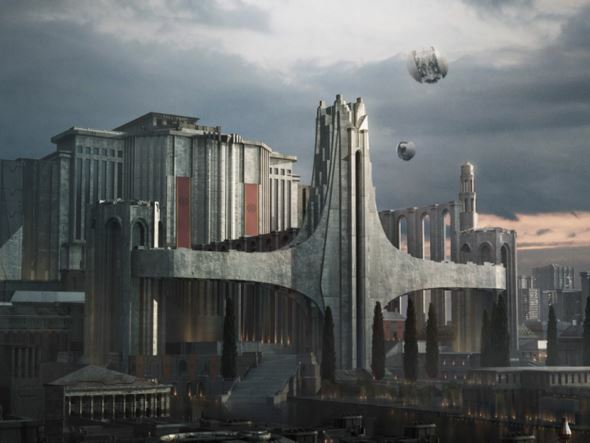 Turbo Tape Games and DREAM THEATER have announced the production of “The Astonishing” game, based on the band’s concept album by the same name. The game will be released on PC, Mac, iOS and Android in April. “The Astonishing” game is based on the album’s story, setting, and characters, giving players an opportunity to further experience the world of Ravenskill and the G.N.E.A. while battling Empirical forces and securing man-made artistry’s place in the futuristic world set forth in the universe of “The Astonishing”. Tactical gameplay and a storyline that progresses with the player make this a can’t-miss experience for gamers and music fans alike. The game will share core gameplay mechanics with Turbo Tape Games‘ critically acclaimed “UHR: Warlords”, with several enhancements for this new project. “The Astonishing” game will be available as a free download for iOS, Android, PC and Mac with a one-time fee to continue playing past the first two missions. The game features both single-player and multi-player pass-and-play same-device functionality. “The Astonishing” was released on January 29 via Roadrunner. The CD was made available in a wide range of distinctive versions, including standard 2-CD set, 4-LP vinyl box set and a limited-edition deluxe box set. Recorded at Cove City Sound Studios in Glen Cove, New York, with John Petrucci producing, studio luminary Richard Chycki (AEROSMITH, RUSH) engineering/mixing and legendary arranger, composer and conductor David Campbell orchestrating, “The Astonishing” paints a tale of a retro-futurist post-apocalyptic dystopia ruled by medieval style feudalism. It’s a place aching for a Chosen One to rise above the noise and defeat an Empire defined by the endless drone of noise machines and the illusion of safety in bland conformity. Vegas Rocks! Magazine has announced that SCORPIONS will make an appearance to receive the “Classic Rock Outstanding Lifetime Achievement” award at the first annual Vegas Rocks! Hair Metal Awards. In addition, German metal queen Doro Pesch will be presented with the “Metal Goddess” award at the event, which will be held Sunday, May 15 at the Casablanca Event Center At Eastside Cannery Casino in Las Vegas, Nevada. Producer and co-host of the event and Vegas Rocks! Magazine publisher Sally Steele says: “We are thrilled to welcome and honor great artists like SCORPIONS and TWISTED SISTER who have made such a brilliant contribution to music over the decades. There are also many other artists from the era of the ’80s who were never given much credit as great musicians and we are here to also show them recognition. Other artists slated to appear and to be honored/featured at the Vegas Rocks! Hair Metal Awards are QUIET RIOT, WINGER and ANGEL (full original lineup). There will also be a tribute to MOTÖRHEAD‘s Lemmy Kilmister, which will include a performance by major metal stars. Tickets are available for purchase at Ticketmaster or in person at the Eastside Cannery box office or by calling the Cannery box office at (702) 856-5300 or going to www.VegasRocks.com. As it stands now, two gigs have yet to get new show dates: Atlantic City, New Jersey; and Brooklyn, New York — with the San Antonio, Texas not being rescheduled. None of the nine rescheduled concerts feature STYX or TESLA. After reaching a new level of recognition with their last album “Ride On” and a position on the 2014 Rockstar Energy Drink Mayhem Festival, gritty southern metal four-piece TEXAS HIPPIE COALITION is back with its fourth full-length album, “Dark Side Of Black”, due on April 22 via Carved Records. Embracing southern roots while exploring a heavier sound than ever before, “Dark Side Of Black” achieves a murky, groovier feel while not straying too far from TEXAS HIPPIE COALITION‘s tried-and-true brand of rugged outlaw rock. The CD was recorded at Boot Hill Studio in Corinth, Texas and Valve Studios in Dallas, Texas with producer Sterling Winfield (PANTERA, HELLYEAH, DAMAGEPLAN). Although the members of TEXAS HIPPIE COALITION are experts at their trade, recording “Dark Side Of Black” wasn’t easy at times. TEXAS HIPPIE COALITION drummer Timmy Braun went through a physical struggle while recording the album, having just recovered from a serious infection shortly beforehand. He feels, perhaps, that this struggle influenced his recording style overall.